Best Hiking Chocolate: What's Not To Love? Hiking chocolate: It's not just for breakfast any more! Seriously, high quality chocolate deserves a place on a hiker's list of go-to foods, for plenty of good reasons. Maybe you've read about the latest research highlighting its heart-protective benefits, or heard a news blurb about chocolate as a wonder food. But I believe a few words of caution are in order. Not every type of chocolate is the "good" kind for hikers, even if it tastes good. 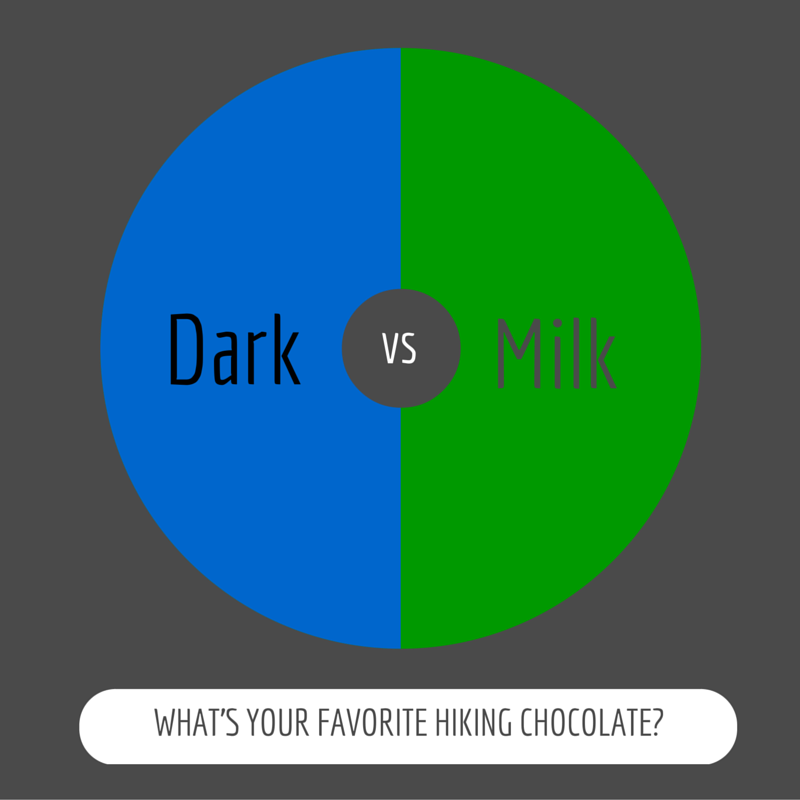 The first thing to consider when selecting hiking chocolate is the amount of antioxidants the chocolate contains. Well, to keep it short and sweet ;) we need to consume molecular oxygen in order to make energy at the cellular level (adenosine triphosphate in our mitochondria, to be not so short). The two atoms of oxygen bonded into each atmospheric oxygen molecule can cause trouble in the process, trying to rip off electrons from nearby molecules. An anti-oxidant works to protect your cells from these "rogue" oxygen free radicals. So consuming antioxidants in your diet is a good daily habit, cellularly speaking. For example, arteries are protected against cholesterol oxidation and plaque formation by antioxidants. And doesn't it make sense for hikers, who are breathing deeply hour after hour on the trail, pulling lots of oxygen molecules through their respiratory system and circulating it via blood vessels through the heart and out to the tissues, to consume antioxidants? Maybe your taste buds are leading you down the wrong trail about the best hiking chocolate. It turns out that dark chocolate has lots of flavonoids (plant based antioxidants), with flavanol being the specific type found in cocoa. Mother Nature puts flavanols into other foods, too: cranberries, onions, apples, red wine. Hmm, chocolate + red wine... oops, my mind is wandering off topic here. It's important to be discriminating in the type of chocolate you put into your lunch sack: you want cocoa with high amounts of flavanol. This molecule can be stripped away during processing, and you don't want to waste calories on chocolate that doesn't protect your cardiovascular system. Sadly, what passes for chocolate on American store shelves has been highly processed. Our taste buds have been trained to want super-sweet candy bars, which means sugar predominates. And "Dutch" chocolate has been alkalized - there's not much flavanol left in it. So check the label before you purchase chocolate for your hiking lunch or trail snack. To complicate this picture, there are lots of low quality fats added to the highly processed chocolate. This adds calories, but not necessarily nutrients. It's part of why chocolate has gotten a bad reputation in the hiking nutrition world. So what ends up being labeled "chocolate" isn't always that great for a hiker's body. To be fair, high quality cocoa (cacao) crammed full of flavanols is slightly bitter, and not very palatable by itself. So a sweetener and fat must be added or people won't buy it. Just watch out for how MUCH fat is added. We've been told that fat is bad for us. Yet the cocoa butter used in making high quality chocolate has components in it which can either protect (oleic acid) or are neutral (stearic acid) in terms of your cardiovascular health. There's more to it than this, but for now, are you with me? Chocolate is not the big, bad food it was once made out to be. It has a legitimate place in your hiking lunch sack. However, this is not a license to ingest massive amounts of chocolate during a hike. An ounce here, an ounce there, is what I'm recommending. Overindulging in chocolate racks up fat calories and plays havoc with your blood sugar levels, things to avoid if you want to keep hiking into your nineties! So please play around with the source of your chocolate. Don't settle for the icky-sweet, over processed stuff on the supermarket shelves. Ferret out the dark chocolate brands, 55% cacoa and higher from reputable companies. Locate the best sources for hiking chocolate. Do some taste tests (now there's a sweet homework assignment). Consume it regularly on the trail in small quantities. Hiking chocolate: just one more reason to lace up your boots and hit the trail! To get you started in your search for the very best chocolate for hiking, let me share my time tested favorites with you. Luckily for me, I live in a city (Seattle, WA, USA) that takes its chocolate VERY seriously, so I have plenty of options for experimenting with a nice balance between nutrition, price, and taste. My favorite small act of kindness to myself each hiking season is to purchase a new type of hiking chocolate to share on the trail. Theo's Chocolate. USDA certified organic, fair trade, not cheap but pretty close to heaven. Currently, my favorite hiking chocolate is the cherry & almond 70% cacoa dark chocolate bar. I find just a small square deeply satisfying. And by buying in bulk and keeping my stash in the freezer, the "per bar" price is much more reasonable than if I buy them one at a time at the grocery store. One more tip: if you're a fan of almond butter cups, they have a fantastic dark chocolate option! Theo's deserves a place in anyone's search for high quality hiking chocolate. You're worth it, don't you think? Visiting or living in Seattle? Geographic tip: If you ever find yourself in the Fremont neighborhood of Seattle, sign up for a tour of Theo's chocolate factory. Lots of free samples, and the smell alone will make you swoon. They give you an insight into some history, too. they got that name right! Try all of the types until you hit upon your favorite hiking chocolate. Now wouldn't that be a hardship! Need a hint? Here's my favorite: dark chocolate with raspberries. It really satisfies my craving for fruit on a long hike. Who wouldn't love something named Pound Plus Bittersweet Chocolate? Here's a lot of hiking chocolate for not a lot of money, and it's tasty, too. I really like the "with almonds" version. But you can buy it nut-less. Tip: I break it into hunks and throw it into a small zip lock bag. It travels well, and a small amount satisfies me as an after lunch snack. If you're lucky enough to have access to this store, check out this chocolate. Or save time - buy it on line! Then store it in the refrigerator. Breaking news! Someone handed me one of these organic dark peanut butter cups the other day, and I was amazed at its chocolatey goodness. Can't let the almond butter cups have all the fun, now can we! Buying in bulk is definitely the way to go with these tasty little cups, because you can't eat just one on a hiking trail. And your trail buddies are going to cast envious glances your way. This company does a lot of things right, taste being just one of them. As soon as you stop hiking for the day, fire up the stove and boil some water to rehydrate some dark chocolate-y goodness. It fills your stomach, starts the rehydration process, and satisfies any cravings until you can get camp set up and dinner going. The carbs in the hot chocolate will begin to replenish your glycogen stores, leading to better performance the next day on the trail. In cooler weather it's an added buffer against hypothermia. 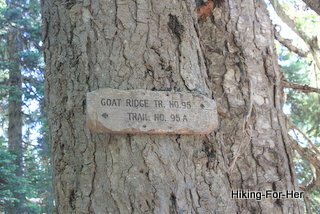 Only out for a day hike? First the chocolate: Theo's vegan dark drinking chocolate. Bring an extra hiking sock and slide the thermos into it, then snuggle sock + thermos into the middle of your pack to stay warm. Believe me, you will feel pampered when you take your first sip of that hot velvety goodness. This tip is for backpackers. There is a lot of research pointing to cacoa nibs as a superfood. Organic raw nibs give you magnesium, iron, and essential fatty acids while you're pushing your body hard on a backpacking trail. They weigh almost nothing, and have a satisfying crunch. Note: They are not sweetened, so if you're expecting the chocolately goodness of the bars described above, you're out of luck. But adding a handful of these organic raw cacao nibs into your trail mix is a smart thing to do. If you want chocolate covered cacoa nibs as a backpacking dessert, these are the ones I indulge in on the trail. A bit(e) of chocolate makes any trail sweeter! If you're a chocolate lover, don't forego your favorite treat on a hike. Especially if you're hiking in cold weather. Just be smart about it!